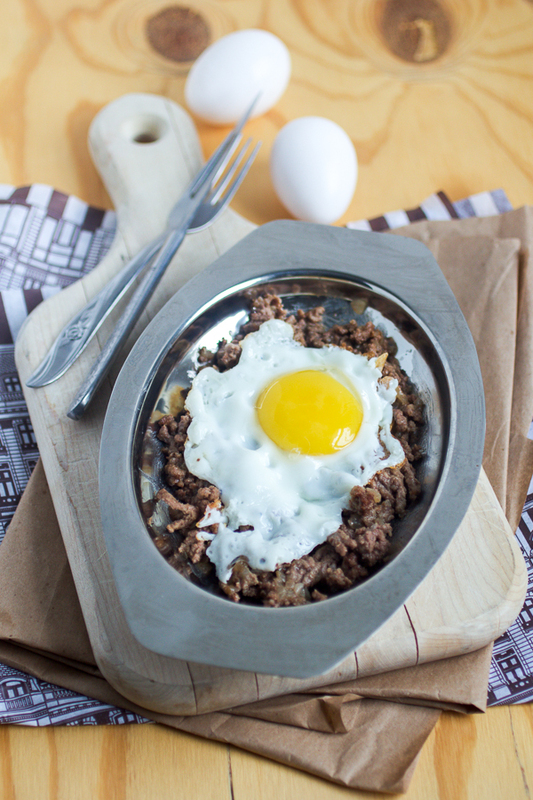 You love them, but have you had eggs with ground meat before? One-pan, breakfast-inspired meal, done in 20-min or less. Not sure when this happened, but in the US eggs are almost strictly in the breakfast domain. Except for a few appearances as a side it rarely gets to be the main dish. This isn’t so in the Balkans. I remember a few times when, overwhelmed with responsibilities, mom asked me to make myself eggs for lunch or dinner. Still I can completely understand how, if you’ve grown up to see foods as designated to a specific meal, it can be challenging to leave that comfort zone and try them out differently. I have a hard time to eat a salad and feel full. It feels more natural to have it as a side dish or an appetizer. To counteract this, I add meat. Magic happens: salad is instantly transformed and I see it in a whole new light. I am hoping today’s čimbur will do that for you and eggs. 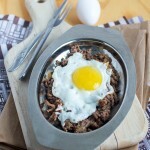 A note, most čimbur recipes ask the pan be covered when egg is added to the meat, so a small membrane develops over the egg. I prefer it without the membrane so I don’t cover the pan near the end of cooking. Čimbur, as you’ll encounter, can be made many different ways. Some people skip the meat and add soft cheeses to the eggs and call them the same. The one we’re doing today is the old school čimbur. And if you’re wondering how to use up eggs, here are 34 ideas of how to use them up, via Recipe Lion. In a skillet heat up oil on medium. Add onion and simmer until it crystalizes. Add meat, and simmer for 3-5 minutes until meat is pinkish, and releases its juices. If you don’t like the meat juice, strain it, and add a little bit of water to keep the fluid level the same. Add seasonings, stir and simmer for another 3-5 minutes. 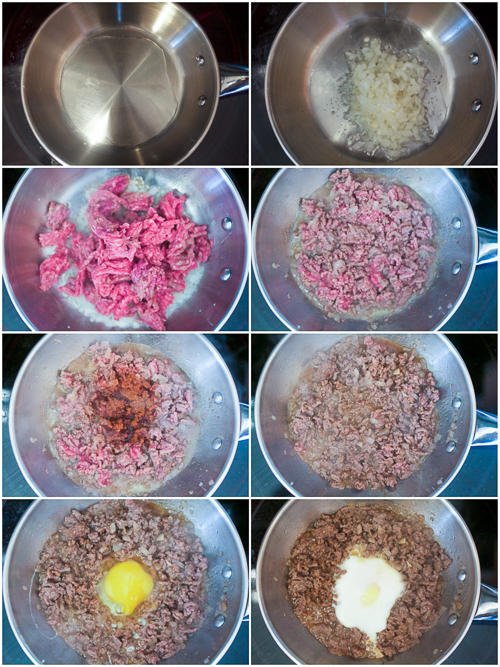 Make four “holes” in the meat in the pan and break eggs into each. Cover the skillet, and simmer 3-5 minutes. Serve hot.